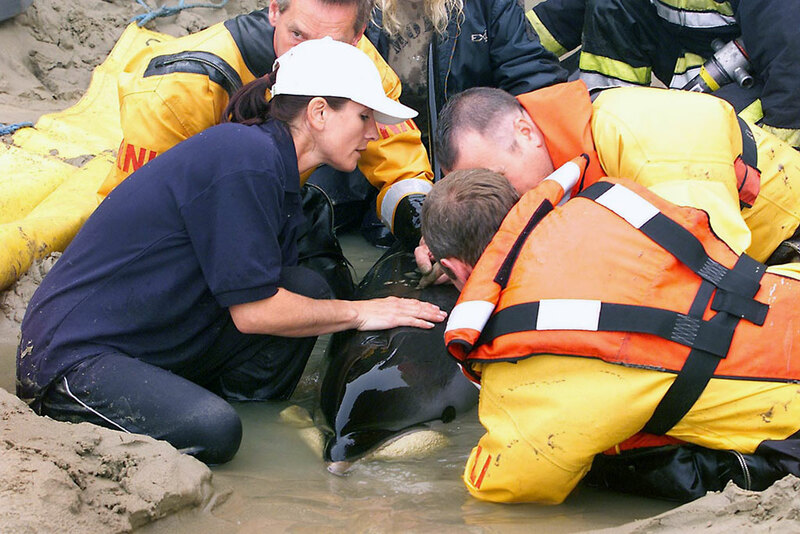 Several of WRAS’s rescuers are also trained Marine Mammal Medics by British Divers Marine Life Rescue (BDMLR). WRAS would like to thank and acknowledge BDMLR’s help in numerous rescues across Sussex and for the training given to WRAS rescuers. Cetaceans (whales, dolphins and porpoises) strand for numerous reasons sometimes due to geomagetic contours which cross beaches, gently shelving beaches which do not reflect echolocation properly, chasing prey up onto beaches, unfamiliar coastal configurations or usual weather patterns. They may also strand due to social reasons following a sick or injured animal up onto the beach. Cetaceans will also strand due to illness and injury. Send someone to ring or call WRAS or BDMLR from your mobile as soon as possible, remembering to note the exact location of where the animal has stranded. Do not push the animal back into water or pick it up and move it back into deeper water. Do not hold the animal under water or you ay drown it. Cetaceans can survive short periods of time on the beach if supported and cared for properly. Keep noises and movement around the animal as quiet as possible and stand behind the animals line of sight. Keep dogs and children away. Use the flats of your hands try to role and hold the animal into an upright position. Cover the animal with sheets or seaweed and keep wet. Use buckets / hose to continuously apply water to the cetaceans skin. Dig trenches either side of the animal where the side fins are so that they can point downwards. The animal can become uncomfortable if these fins are horizontal or pointing upwards at all. Protect the blow hole to the top of the animals head, so that sand and water does not enter, cup your hand around one side but do not cover the blow hole or restrict the animals ability to breath. Ensure you do not hold your head over the blow hole as you could catch an illnesses from the animals exhaled air. Do not pure water into the blow hole, this is the equivalent or your nose an you will drown them if you do. Wait for BDMLR or WRAS rescuers to arrive. For further information on cetacean strandings or on how to become trained as a Marine Mammal Medic please go to BDMLR’s website. BDMLR can be contacted on 01825 765 546, 24 hours a day.